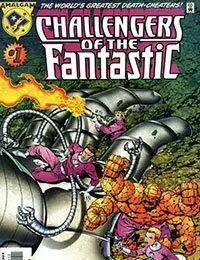 A group of explorers (Sue Ace Storm, Reed Prof Richards, Johnny Red Storm &amp; Ben Rocky Grimm) narrowly avoid a horrible accident in space. Realizing they are on borrowed time, they decide to always face Fantastic. So they are eager when they get a call. Uatu the Guardian shows up and warns them that Galactiac is on his way to devour Earth. Thankfully their blind friend June Masters has talked Galactiacs Herald, the Silver Racer (Silver Surfer, Black Racer) into helping the Challengers. During their Confrontation Galactiac turns Rocky Grimm into a Rocky Punisher (The Thing , Punisher Robot). At the same time Uatu is leading Johnny Storm to a place in the machine where he can nullify the effects of what Galactiac is doing. After Reed uses his Octopus arms to get him and Sue out of Bens way, Johnny finally destroys Galactiacs machine, changing Ben back to normal, and freezing Galactiac. At the last moment though, Galactiacs head launches from his body. Across two, Dr. Doomsday (Dr. Doom , Doomsday) finds the Silver Racer and absorbs his power. Only so he can exact revenge on The Challengers Of The Fantastic.